We the inmates, [prisoners], at the High Risk Management Unit at Goulburn Correctional Centre, would like to ask you for help in receiving equal treatment and opportunities as other inmates throughout the system. As we are told that we are not in a segregation units, [solitary confinement units], but we are treated as though we are in one. We the inmates at the High Risk Management Unit at Goulburn Correctional Centre, would like to ask you for help in receiving equal treatment and opportunities as other inmates throughout the system. As we are told that we are not in a segregation units, but we are treated as though we are in one. Firstly we are being housed in a segregation type environment and yet we are being told that we are not in segregation but we are on normal discipline status, this is in regards to 9 unit and 8 unit of the HRMU. This is totally false, we are not being housed as normal discipline prisoners, but we are being housed as segregation prisoners, and in some cases inmates are being housed in 7 unit which is officially called and used as a segregation and those prisoners are being told that they are not in segregation. They are telling us that we are on a program" this is merely the legal wording they are using to disguise the fact that we are really being housed as segregation prisoners. 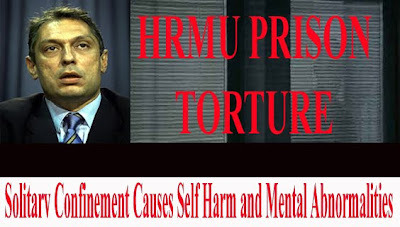 The only so called program that is currently operating in the HRMU is not designed to help inmates better themselves and try to get REHABILITATION and try to move forward, but it has been designed purposely to ensure that inmates do not move forward to better themselves, and effectively end up staying in segregation for as long as possible and in most cases for years. The so called program is also designed simply to give correctional staff the power to play God with what little day to day necessities we can actually get within the HRMU. Basically its designed so that the correctional staff can punish the inmates and take away what little privileges we have or have been given, without even being charged with any offence or having any other formal disciplinary action taken against them. So effectively if we are not jumping through hoops for them all day we will be dealt with in an off the record manner. As a result of this it is causing us inmates in the HRMU a lot of stress and frustration's, anger and the feeling of injustice, on a daily basis, over the continual deprivation of quite a lot of day to day necessities, which normal discipline prisoners have access to, and I have to say unlimited access to it every day. We all feel that this kind of treatment is purposely designed to push the inmates over the edge in the hope they will lash out in various unlawful ways so as to give the correctional staff an excuse to take even more things away from the inmates and keep the inmates locked away in here even longer. This is why we are lodging our concerns and grievances to you, because we are trying to get some form of justice, some equal opportunities as normal discipline inmates (if that is in fact what we are), and we are trying to avoid the inevitable madness we are all heading to under this current regime in the HRMU. Past history on prisoners has shown that when prisoners are put in segregation environments for lengthy periods of time and subjected to stressful and frustrating living conditions, the results is always the same, the day to day pressures become too much and it is only a matter of time before prisoners end up behaving in violent and anti social ways on a larger scale. This is what we are trying to avoid, also recent studies has shown that when inmates are housed in positive, productive, minimal stress environments the inmates are far more positive and productive and are not walking around all day either stressed, depressed, unhappy and frustrated and the likely hood of inmates behaving in violent, anti social ways is highly remote. We cannot understand why a positive approach is not being used with us inmates of the HRMU and instead we are being forced to live under a highly stressful and frustrating regime. Given the facts of what past correctional centres history has shown and what recent official prison studies has shown (which we are quite certain then NSW prison officials are fully aware of). We are highly suspicious and convinced about what the correctional staff and their regime is trying to achieve with the inmates of the HRMU. Nearly all the inmates in the HRMU are serving life sentences or sentences around 20 year mark, so it is obvious that the only thing we have to look forward to is trying to live out our lives in prison as positively and productively as possible under as least stress and frustration as possible. What we do not understand is this? If you take all that away from us, what else do we have to look forward to? This is a question still yet to be answered by anyone. Since the HRMU was opened in September 2001, there has been at least one inmate who has attempted to take his life; (possibly more records will show). There have been numerous incidences of physical altercations between inmates and correctional staff and there has been numerous inmates go on hunger strikes, plus there is one inmate who is continually committing self-harm (records will show). Some inmates have smashed their TV, and other electrical's out of total frustration and depression there is constantly verbal altercations between inmates and correctional staff, on an almost daily basis. Some inmates are effectively being punished in various ways without there even being any unlawful incidents, charges laid or formal disciplinary action been taken. This is not the regime of a normal discipline inmate in fact this current HRMU regime is not even a standard segregation regime. The rest of the NSW prison system (normal discipline especially) is not being subjected to this kind of treatment, so why are we being subjected to this kind of treatment? We all strongly feel that this is total discrimination and unfair treatment and abuse of power by the authorities. We declare that it is affecting the prisoners mentally and physically. It seems clear to us all that under this HRMU regime we are only heading in one direction a counter productive negative one. We are unable to get any fresh air in our cells at night through any open window. Instead we have to breathe in stale recycled air from air vents 24 hours a day. No other normal discipline prisoners are being subjected to this. We are unable to associate together as normal discipline inmates; the best we can get is to associate with one other inmate at a time. And were separated into racial groups. This is not normal discipline. We have no education or teachers permanent or even regular in the HRMU, we think this is very disturbing and appalling. We are being deprived of having unlimited access or even daily access to the phone to ring our friends, family and spouses outside. All other normal discipline prisoners across the state have unlimited access to a phone every day. The H RMU has the facilities to allow inmate to ring up every day without disturbing the security and good order of the jail, yet they refuse to let us have any more than a few phone calls a week. Obviously the phone is a major part of being able to maintain relationships with loved ones "especially whilst in prison" so why are we being deprived of a major part of our rehabilitation "contact with loved ones?" This is purely and simply a form of punishment and we feel it is most disturbing and appalling. We are not allowed to have our own electrical items, which we have purchased through the prison activities buy ups. Obviously due to security reasons, which we can understand, ie TV, RADIO, JUG, SANDWICH MAKER, RICE COOKERS, WALKMANS, CD, PLAYERS, FAN. So the HRMU has to compensate for this and supply us with all those things. But there's a catch, they have now turned our daily belongings into a long drawn out mind game, so effectively they can play God with items that are not even an issue to all other normal discipline inmates unless they have been charged or had disciplinary action taken against them and been taken off amenities, but to the HRMU program it takes us roughly a few months of sitting around in an isolation cell with nothing just to get a jug or a radio and if lucky a TV. Then we have to wait till we are all the way to the end of the program just to get a sandwich maker, that's roughly 12 to 18 months minimal and without a single charge or any formal disciplinary action been taken, it can all be taken away from you instantly if the correctional staff wish to do so. We have no equipment to cook a hot meal in our cells at night and they wont give us any or let us have our own rice cooker, and Goulburn is a very cold climate correctional centre, yet we are simply unable to cook a hot meal in our cell after 3:pm. We cannot keep warm in our cells at night because the air vent are pumping out cold air all day and night, they wont give us any kind of heating system, this is a breach of human rights. The visits are of very poor quality to say the least, there is only bolt down metal tables and seating with no back support at all and that is what our visitors and us have to sit on for the duration of the visit, without back support our backs become stiff and sore (visitors and inmates) they do not even supply any activities for the kids, nor do they supply proper beverages for the visitors this is an insult to all the visitors that enter the centre. We have no access to any sort of weight machine or cable weights, and no access to various cardiovascular training equipment, ie boxing bag, focus pads, skipping ropes, touch football. These things are a vital part of our well being as it offers a positive outlet for our excess energy and frustration, and also it is to help us keep fit and healthy, which the majority of us like to do. Doesn't make logical sense for us to be able to release our excess energy and frustration in a positive manner rather than a negative manner? We are unable to purchase on the canteen buy up a lot of the food and items that all the other "normal discipline" prisoners can purchase on the canteen buy up. Fair enough if we can't have food in tin or glass due to security reasons, but why can't we get appropriate substitutes? Because at present our food situation is far from a "normal discipline" standard. Our limited activities buy up-is not anywhere near a normal discipline standard. And yet most of the items on the normal discipline activities are in no way a risk to the good order and security of the jail. We ask why can't we have a broader range of items like every other normal discipline inmate. There are a lot of aboriginal prisoners in the HRMU, all of whom like to do indigenous artwork and paintings as part of their culture and education,yet to this day are still unable to do so. We cannot get to buy music of our individual liking because 95 per cent of the music we try to buy through the activities buy ups is only available on CD, and not on tape, and we are only allowed to have walkmans which play tapes, and not CD players so this is not normal discipline. This is not normal discipline, this is unfair treatment, discrimination, and lack of equal opportunity, counter productive, stress, frustration, anger and depression, which only creates and unstable-unacceptable environment. It is unprecedented what is happening to us, as no other normal discipline inmates are being subjected to this kind of treatment anywhere within the state of NSW and this is a total abuse of power. We the inmates of the Goulburn HRMU are stating that this current so called program is not designed in the better interests of our mental and physical well being (short term or long term). It is designed to give the correctional staff the power to deprive us of basic daily necessities and to play mind games with us and to make a bad thing even worse for us the inmates. In short, the treatment of the inmates here in the HRMU is nothing short of total abuse - miss management and misuse of power by the correctional staff - to push the inmates over the edge - so they have to stay here longer and longer under these conditions - with no regards to there mental health or well being - not even the professional staff here will go against this system - they would rather turn a blind eye to it all to save there own jobs - they spend most of there time sitting with the correctional staff in the officer station when prisoners have been asking to see them for some time - so we are not getting any help from no one and things are only going to get worse much worse over time. For an example when the centre was first opened there was only three stages to the so called program but as soon as a group of Aboriginal prisoners came to the centre for allegedly assaulting correctional staff they brought the stages up to 12 stages so our thinking is what's next 100 stages. We all appreciate you taking the time to read our letter and we hope that it has made good sense and has been perfectly understandable to you. We trust that you will look into these matters fully and do what you can to assist us before things get right out of hand. In interviews the commissioner has stated on a number of occasions that this centre is at this time housing inmates that are deemed to be the worst of the worst, if this is the case then where are the kid killers, and the paedophiles, and the granny killers that the law states are the lowest of our society? So if that is the case then it is all right for the commissioner to appear on TV and radio and state to our family and friends plus the public that we are the worst of the worst of our society. We would seriously appreciated if you took time to peruse this matter as well. A 19 year old and Kadr Diab 21 convicted of the killing of a young footballer Jai Jago were today sentenced to nine years and 13-year jail terms in the NSW Supreme Court, a decision that had been made by a Judge and a Jury.